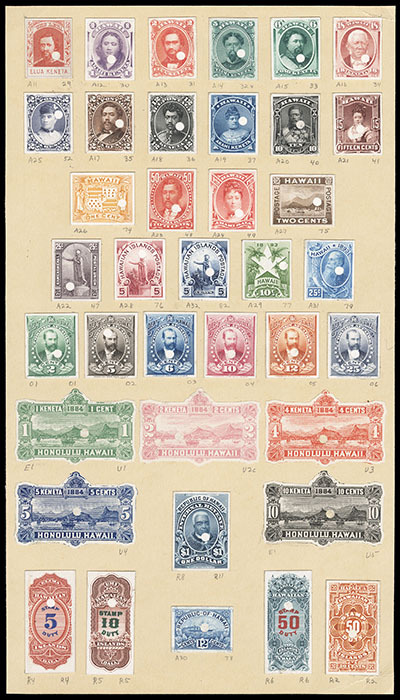 Hawaii, 1869-99 Issues, Sample Presentation Card, of 38 different plate proofs on India mounted on card, each with security punch hole and affixed to manila card; includes 1869 2¢ Re-issue, 1864-91 Banknote issues designs with 5¢ in green trial color, 1894-99 Pictorials, 1896 Officials, 1884 Envelope indicias and five examples of the 1877-97 Revenue issues, Very Fine. Scott No. 29P//R11P Estimate $4,000 - 6,000. A RARE SAMPLE PRESENTATION SHEET OF 38 DIFFERENT PLATE PROOFS OF THE 1869-99 HAWAIIAN ISSUES. 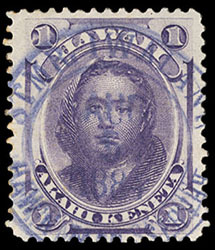 Hawaii, 1871, 1¢ purple, blue 1884 Steamer Iwalani circular date stamp cancel (362, AUXS4-I-I IWALANI, 1R), uncommonly wide margins, Extremely Fine, certainly one of the finest strikes in blue on a stamp. Scott No. 30 Estimate $600 - 800. 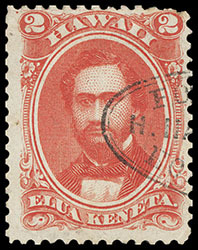 Hawaii, 1864, 2¢ rose vermilion, oval "Forwarded By, H. Hackfeld & Co., Honolulu H. I." handstamp (aux FWOR-HACKFELD, 1RRRR), Very Fine, a very rare forwarder handstamp used on a stamp. Scott No. 31 Estimate $200 - 300. 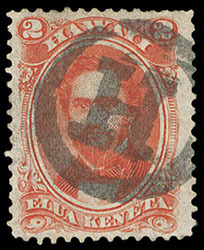 Hawaii, 1864, 2¢ rose vermilion, full Hilo letter "H" in circle cancel (lettH-20(circled H)), Very Fine and choice. 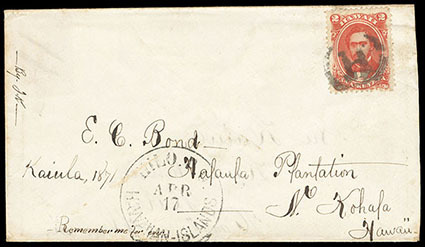 Hawaii, 1864, 2¢ rose vermilion, tied by letter "H" in circle cancel (lett-2H, serifed) on cover to the North Kohala Plantation, with matching "Hilo P.O., Hawaiian - Islands, Apr 17" cds, cover turned with initial usage to Hilo franked with manuscript canceled 1864, 2¢ rose vermilion, Very Fine, an unusual turned usage and scarce North Kohala Plantation destination. Scott No. 31 Estimate $250 - 350. 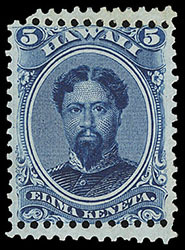 Hawaii, 1866, 5¢ blue, double perforations, showing double rows of perforation at top and bottom, without gum, Very Fine, rare and seldom offered, approximately 25 known; with 2011 H.P.S. certificate. Meyer-Harris No. B3-EP. Scott No. 32 var. Estimate $250 - 350. Hawaii, 1871, 18¢ dull rose, two horizontal pair and single, tied by red "Honolulu, Jan 25, 1897" cds's on oversized registered cover to New York, matching registry and return receipt handstamps; missing backflap, F.-V.F., rare franking. Scott No. 34 Estimate $500 - 750. 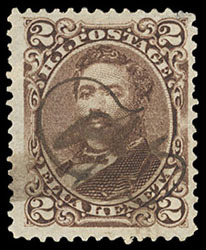 Hawaii, 1875, 2¢ brown, manuscript "C.H.D." initials of Haiku Postmaster C. H. Dickey, pulled perf at top right, otherwise Very Fine, extremely rare with only a few examples known; with 2018 P.S.A.G. certificate. Scott No. 35 Estimate $600 - 800. 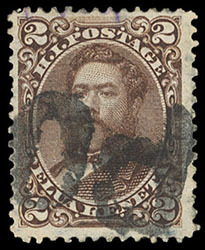 Hawaii, 1875, 2¢ brown, near complete large lettered "PO" cancel (lettPO-15, 1R), Very Fine and choice, rare so bold and complete. Scott No. 35 Estimate $200 - 300. 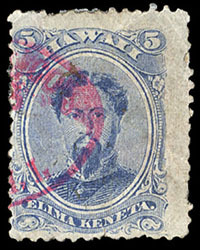 Hawaii, 1882, 5¢ ultramarine, red "Wells, Fargo & Co's, Honolulu, H.I." oval handstamp (662, AUXEXP-WELLS, 1RRRR), small flaws, a F.-V.F. strike. Scott No. 39 Estimate $300 - 400.